Thermoplastic polyolefin is a polymer used to coat low-slope or flat roofing, especially in commercial properties. It gives roof surfaces a weather-resistant coating that looks and feels much like rubber. While the rubbery coating is durable, it isn't the most stylish feature for a property. You can give thermoplastic polyolefin surfaces a facelift with a coat of paint but you'll need the right kind of paint. Certain paints can react with this polymer coating, causing paint discoloration and lessening the weather resistance. 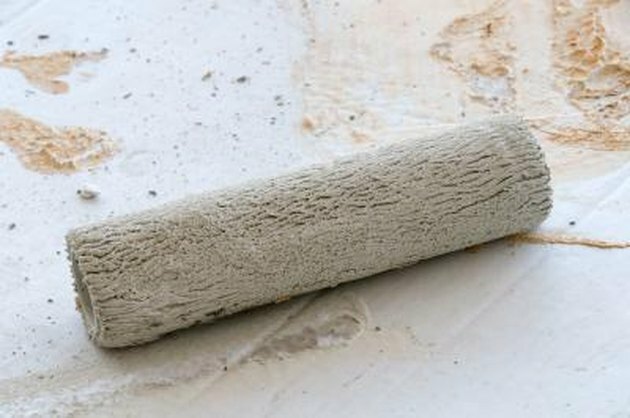 A paint roller provides quicker coverage than a brush. Climb a step ladder or locate a staircase for roof access if your thermoplastic polyolefin surface is on a roof. Thermoplastic polyolefin coatings are almost always on roofs with very minimal sloping but in the rare occurrence of a steep thermoplastic polyolefin roof, always start working at the top of the slope and move downward. Rinse off the thermoplastic polyolefin surface with a garden hose. For indoor surfaces, use a wet rag. Prime the thermoplastic polyolefin with a water-base primer and a medium-nap paint roller. When applying primer, roll on the primer parallel strokes with 50 percent overlap. Wait for the primer to dry before continuing. Paint the surface with acrylic resin emulsion paint. This type of paint is available at most hardware stores, and it does not react with thermoplastic polymers. Apply the paint with a clean medium-nap roller in parallel strokes. An overlap of 50 percent between roller lines reduces visible roller marks. Apply a second coat if necessary after the first coat dries. How Much Kool Seal Will I Need to Cover My Roof?